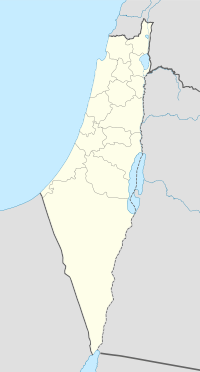 Al-Khalasa (Arabic: الخلصة‎, al-Khalasah; Hebrew: אל-ח'אלצה, al-Khalatsah), was a Palestinian village, located 23 kilometers southwest of the city of Beersheba. The oldest known names of the village are "Halasa" or "Chellous" and it was founded by the Nabateans or invading Mediterranean Plishtim, and then was called "Elusa" under the Byzantines where it served an administrative center in the Negev Desert. It continued as a major town by its modern name "al-Khalasa" during Mamluk rule, but was abandoned sometime in the fifteenth century CE. The ancient city was looted by Muslim Turks in the late 1800s, and many inscriptions from looted ancient Halasa were found by archaeologists later in the Arab Gaza Strip -- rendering the site of little archaeological value. It was repopulated by Bedouin in the early twentieth century, after western archaeologists took an interest in it. In October 1948, it was captured by Israel during the 1948 Arab-Israeli War. The population of al-Khalasa is unknown, but all of the inhabitants were Muslims, from the al-Azizma tribe. Al-Khalasa was founded by the Nabateans in the early 4th century BCE as "al-Khalus" or Haluza. Roman historian Ptolemy identifies it as a town in Idumea west of the Jordan River. After the Roman conquest, al-Khalus was renamed "Elusa", and in the late Roman period it grew to become the principal town of the western Arabia Petraea province. It was the birthplace of Abraham Zenobius a prominent Rhetorician in Antioch. Elusa became one of the first Negev towns to have a large Christian population, and Christians and pagans lived side-by-side. The Bishops of Elusa participated in the church councils 431 and 451 CE. Tomb-stones found in the local cemetery indicate that there were pagans at Elusa as late as the early 5th century. In this period the city belonged to Palestina Tertia. After the Islamic conquest of Palestine, its Arabic name was restored with slight alterations to become al-Khalasa. It retained its prominence as an administrative center during the early Arab Caliphate period until the late 7th century. Eventually, however, the town declined and the place was abandoned for centuries, becoming a place where mainly Gazan plunderers stole stones. Thirteenth-century Syrian geographer Al-Dimashqi records it as one of the major towns of the Negev Desert. Fourteenth century Egyptian geographer, al-Maqrizi said it was one of the larger "cities" in southern desert of Palestine. However, as the Negev trade routes declined, al-Khalasa eventually diminished. By 1841, Edward Robinson recognized that Al-Khalasa was old Elusa. In 1905, the Ecole Biblique of Jerusalem studied archaeological remains in al-Khalasa, and a British survey drew up the plan of an entire the archaeological site. The renewed interest of the village encouraged al-Khalasa's resettlement by the al-Azizma Bedouin tribe of the Negev. They built the village with a triangular plan in between two wadis, with houses constructed of mud and stone. An elementary school was established in the village in 1941, and there were several shops. Most of the inhabitants earned their living through animal husbandry and commerce, and used a well for drinking water. During the 1948 Arab-Israeli War, the village was defended by the Egyptian Army and local militia volunteers. The Arab forces were defeated by Israel's Negev Brigade during Operation Yoav in the last days of October 1948. ^ Archaeological Encyclopedia of the Holy Land, Ed. Avraham Negev,1972, p. 100. Source mis-names Zenobius as Libanius. ^ a b Elusa - (al-Khalasa) Archived 2016-03-05 at the Wayback Machine Studium Biblicum Franciscanum - Jerusalem. 2000-12-19. ^ le Strange, 1890, p.30. ^ a b Khalidi, 1992, p.76. Robinson, Edward; Smith, Eli (1841). Biblical Researches in Palestine, Mount Sinai and Arabia Petraea: A Journal of Travels in the year 1838. 1. Boston: Crocker & Brewster. This page was last edited on 21 March 2019, at 22:22 (UTC).